Police activity on Millbank, in central London, after a car crashed into security barriers outside the Houses of Parliament. A man has been arrested after a number of pedestrians were injured when a car crashed into security barriers outside the Houses of Parliament, Scotland Yard said. Counter-terror police are investigating after a car crashed into security barriers outside the Houses of Parliament, injuring two people. The male driver was arrested, and the area is in lockdown after armed officers swarmed the scene on Tuesday morning. Images posted to social media showed a man, wearing a black puffer jacket, surrounded by police and being led away in handcuffs from a silver-coloured Ford. Two people were taken to hospital after being treated at the scene for injuries, which are not believed to be serious, the London Ambulance Service (LAS) said. Scotland Yard said: "At 07:37hrs on Tuesday 14 August, a silver Ford Fiesta collided with a number of cyclists and pedestrians, before crashing into barriers outside the Houses of Parliament. "The driver of the car, a man in his late 20s, was arrested at the scene by armed officers. He has been taken to a south London police station where he remains in police custody. "He was arrested on suspicion of terrorist offences. "There was nobody else in the vehicle, which remains at the scene and is being searched. No weapons have been recovered at this stage." The force spokesman added: "At this stage, we are treating this as a terrorist incident and the Met's Counter Terrorism Command is now leading the investigation." Witness Ewalina Ochab told the Press Association: "I think it looked intentional - the car drove at speed and towards the barriers." She continued: "I was walking on the other side [of the road]. I heard some noise and someone screamed. "I turned around and I saw a silver car driving very fast close to the railings, maybe even on the pavement." The car appears to have been driven through cyclists before ploughing into the security barrier. Footage shot outside Parliament showed cyclists helping at least one biker laying on the ground as the LAS and armed officers arrived on the scene. An eyewitness, who gave his name only as James, told the BBC Radio 4 Today programme: "There was a cyclist clearly injured on the floor, there was a number of cyclists off their bikes. As I went past, an ambulance turned up." 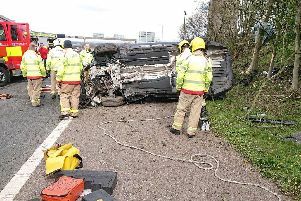 Jason Williams, 45, from Kennington, was walking to work when he saw the crash. "I saw a car going at high speed towards Parliament. It hit a bollard," he told the Press Association. "It looked deliberate. It didn't look like an accident. How do you do that by accident? It was a loud bang." The Metropolitan Police said: "At 7.37am Tuesday August 14, a car was in collision with barriers outside the Houses of Parliament. "The male driver of the car was was arrested by officers at the scene. "A number of pedestrians have been injured. We await an update on their condition, however officers do not believe that anyone is in a life-threatening condition. "Officers remain at the scene and cordons are in place to assist the investigation. Westminster Tube station is closed. "While we are keeping an open mind, the Met's Counter-Terrorism Command is leading the investigation into the Westminster incident." Streets around Parliament Square, Millbank and Victoria Tower Gardens were cordoned off as police, ambulances and firefighters arrived at the scene. Bus driver Victor Ogbomo, 49, was driving passengers past the front of Westminster just after the crash. All I saw was the smoke coming out of a vehicle, a silver vehicle ... I just stopped the bus," he told the Press Association. "The police said we have to move back, then in less than five minutes the response team came. "They went to the vehicle, so we had to push back. I saw the car in the barrier, I didn't know how it got there. "I think someone was inside the vehicle because many police went towards the vehicle." He said officers had their guns out when they arrested the driver. A number of armed police officers remain stationed at a cordon beside Parliament, while Westminster Bridge and Tube station are both closed. The cordon was widened twice and sniffer dogs were seen scanning the area. The Houses of Parliament are surrounded with security barriers of steel and concrete. The measures were extended in the wake of the Westminster Bridge attack in March 2017 when Khalid Masood ploughed a car into crowds on Westminster Bridge, killing four people. Masood abandoned his car then stabbed and killed unarmed Pc Keith Palmer before he was shot by armed police in a courtyard outside Parliament. The terrorist threat against the UK is seen as unprecedented. In addition to five attacks that occurred last year, authorities say they have stopped 13 Islamist and four extreme right-wing plots since the Westminster atrocity in March 2017. Police and MI5 are running at least 500 live operations involving roughly 3,000 active "subjects of interest" at any one time - while there is also a wider pool of more than 20,000 individuals who have previously featured in probes whose threat must be kept under review. Earlier this year, the Government unveiled a refreshed counter-terror strategy. Under the blueprint, MI5 intelligence will be shared with bodies outside the security community in an attempt to stop suspects before attack plots can crystallise, while anti-terror laws are to be strengthened to allow earlier interventions.